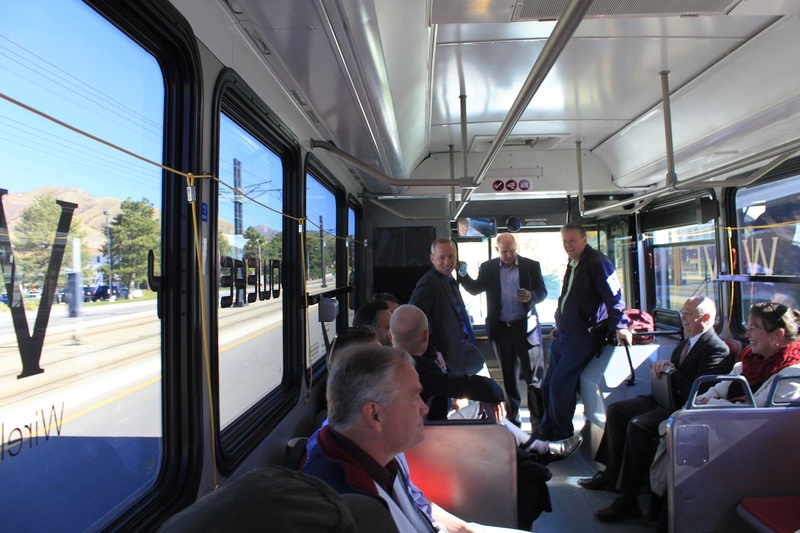 Taking a test ride on the first electric bus at the U and the first in commercial use in the nation. We’re on the electric bus, but there are no Merry Pranksters, no Acid Tests, just a bunch of people dressed mostly in suits. Yet, like on other forms of public transit, I feel like we’re all in this together. Does that mean we’ve achieved intersubjectivity? 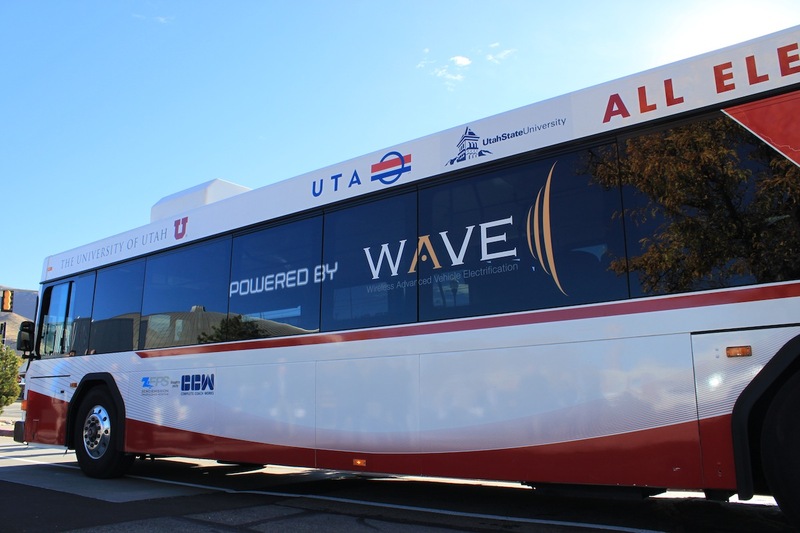 Indeed we’d come together for common cause – to mark the launch of the University’s first electrified bus, the result of a public-private partnership between the University, UTA, and WAVE Technologies (short for Wireless Advanced Vehicle Electrification). Instead of a traditional ribbon cutting, they cut a power cord. 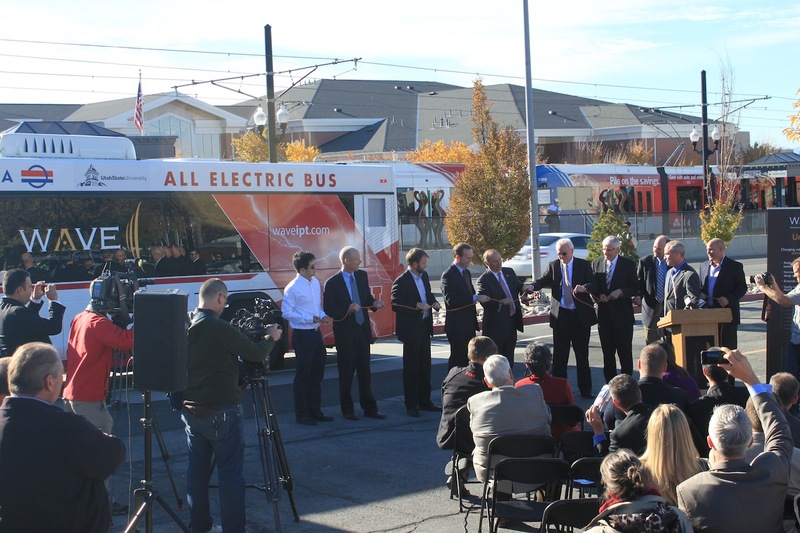 Cutting the cord to launch the electric bus. WAVE’s magnetic induction technology allows for wireless charging at bus stops, meaning this bus can make use of smaller, lighter and less expensive batteries than other electric buses around the country. The charging process is similar to how electric toothbrushes charge or the way an induction oven functions. Essentially, current is directed through a wire coil to create a magnetic field, which bridges the gap through air to excite electrons in another coil plate, which then converts the energy back into electricity and charges the battery. 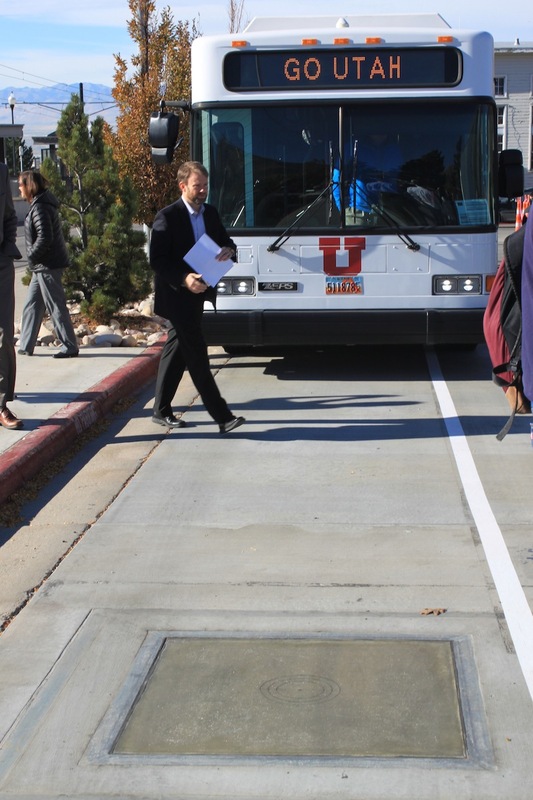 The technology for the bus was first developed at Utah State University in the Energy Dynamics Lab as a part of the Utah Science Technology and Research (USTAR) initiative. USTAR focuses on commercializing new technologies through collaboration with industry in order to increase innovation, entrepreneurship, and investment in the state. 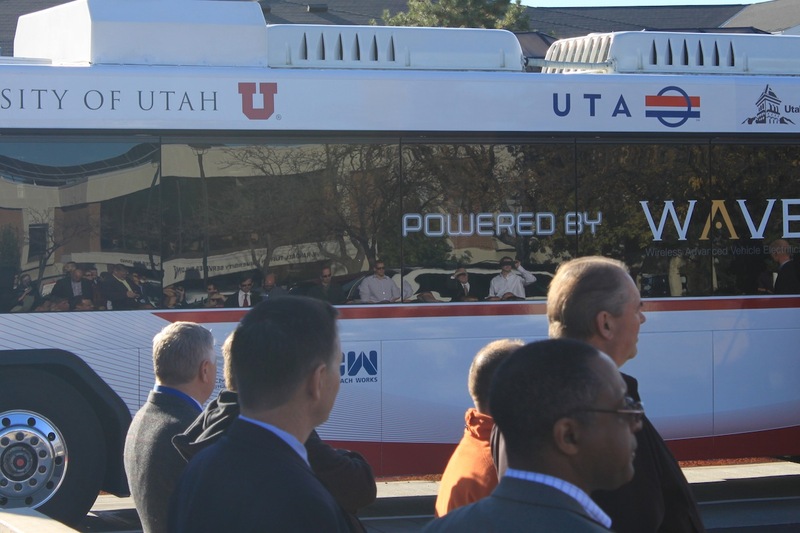 The first electric bus on campus represents a public-private partnership between the U, UTA, FTA, USU and WAVE. Robert Behunin, vice president for advancement and commercialization at Utah State University, noted a couple of historic components to the event: that the bus is the first wirelessly-charged bus in commercial use in the country, and that it also represents an exciting partnership between friendly rivals, the University of Utah and USU. Behunin added that the Energy Dynamics Lab is moving forward with research on an in-motion charging track in hopes to carry the concept even further. Some see WAVE technology as a step toward the Highway of the Future, in which charging pads would be embedded along the roadway and enable a complete switch to private electric vehicles that never need to be plugged in. I hear this as yet another techno-solution that, instead of making our lives better, will more than likely lead to more personal vehicles, more fragmented cities, more destructive land use patterns, more mining of rare earth metals, more obesity, and so forth. A recent article in WIRED, arguing that self-driving personal vehicles might encourage sprawl, only seems to confirm that concern. Christensen refers me to a video from the Congress for New Urbanism showing that the energy saved in a year by switching all the light bulbs in a house from incandescents to CFLs is roughly equivalent to the energy saved in just one week by living in a walkable neighborhood and not driving. Rep. Johnny Anderson walks past the wireless charging pad. Michael Allegra, president of UTA, remarked on the agency’s obligations both to run a sustainable transit system and to create a sustainable community more broadly. This vision includes getting more cars off the road. “We see the day when we’re all electric,” he said, noting that WAVE’s wireless charging has applications for light rail and streetcars as well. The ability to implement the technology through retrofitting existing buses with an electric drivetrain and induction charging plates means that it can more easily expand across transit fleets. When WAVE’s CEO Mike Masquelier got up to speak, only the pshhh of the bus’s air braking system gave a clue that it had started up behind him. All of us craned our heads to make out the sound of the electric shuttle not making sound, over the motor noise of regular old buses and cars passing by on South Campus Drive. 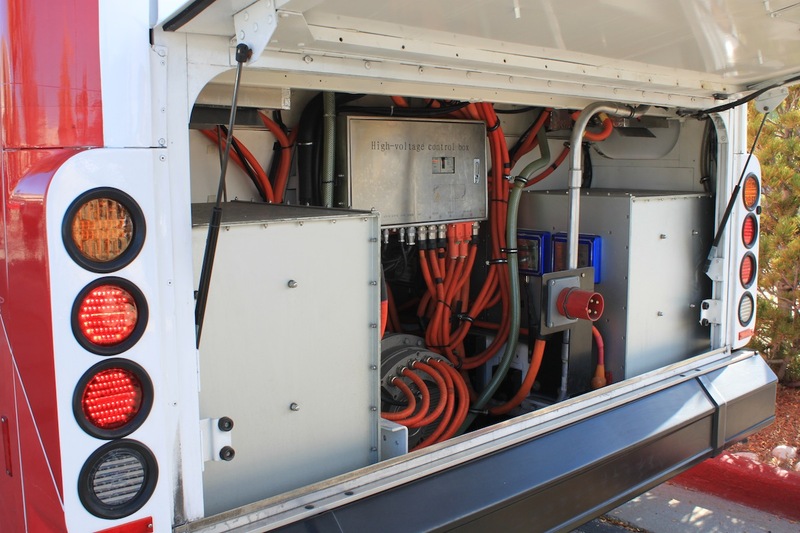 A look under the “hood” of the electric bus shows that not all cords were cut at the event. The roots of WAVE’s charging technology date back to 1900, when Nikola Tesla, inventor of the alternating current generator and inspiration for the name of the Tesla electric car, filed the first patent on wireless power transfer. A century of development in batteries and power transfer has at last made that early innovation practical. “Technology becomes elegant when it’s invisible to its users,” Masquelier had said. We’re riding the bus today, of course, because we want to somehow see the invisible. As the shuttle rolls along, someone in the back says, “It’s ridiculous; it’s so quiet!” Another voice adds, “I can’t really tell a difference from the other buses. It’s quieter, but that’s it.” In a way, this ride is underwhelming. After all, it’s just a bus – though a bus with some fascinating technology and intriguing implications for public transit. Inside the electric bus, red seats await you. Today it’s warm, but the broadleaf trees are decked out in yellow, peeling back their layers bit by bit, down to their winter forms. Out in the valley, over the shoulder of the capitol, smog is already developing. From the back of the electric bus, I am trying to get a decent photo of the Oquirrhs outlined in a sky of autumn blue, but all my camera is capturing are parking lots, construction zones, and power poles. We’ve arrived at the Warnock Engineering Building to let off a group for lunch and then head back to the main event. Christensen is busy talking transit planning in the front of the bus with the others. He told me earlier that a study done on the commuting preferences of U students had found that those in engineering were more likely to drive because their building was the furthest point on campus from TRAX. 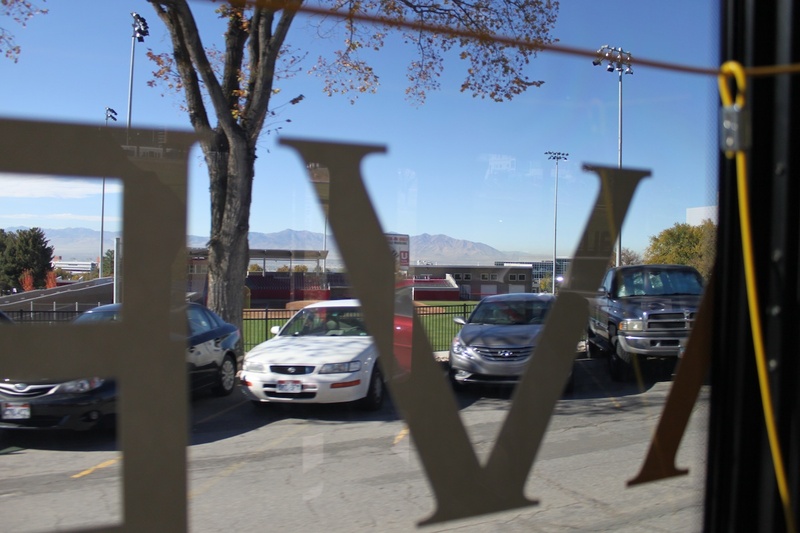 A view to the Oquirrhs, sort of. That’s something the electric shuttle aims to solve. Eventually it will run through the heart of campus, from the South Campus TRAX stop to the Warnock Engineering Building, the first shuttle to do so. Opposition to that route has slowed its rollout, with worries that noise and diesel fumes might disrupt the character of campus. But the quiet and clean electric shuttle has allayed these concerns over time. 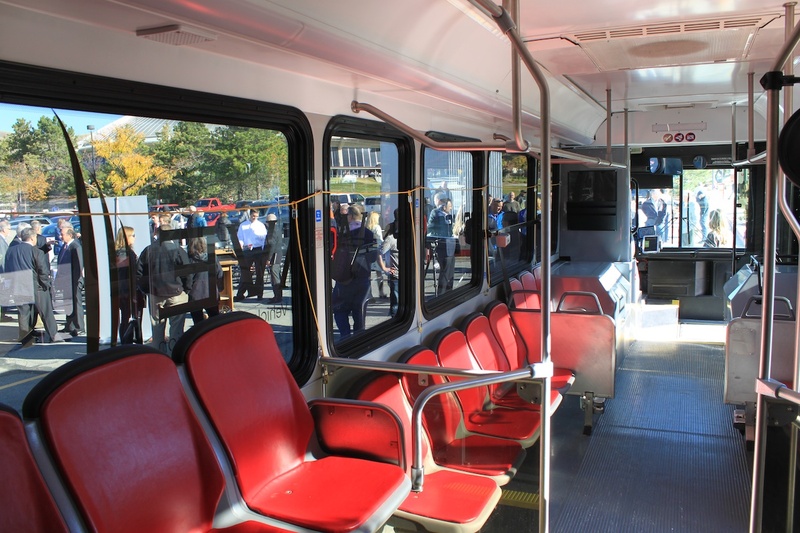 “This thing makes less noise than a typical skateboard,” the U’s director of Commuter Services Alma Allred said during the cord cutting ceremony. I can attest to that. On the return trip to the parking lot and the event, the whir of the electric drive falls silent at a stop light. Conversations also quiet and I can easily make out the click of the turn signal from the back. Dr. Hunter Wu, who one speaker jokingly referred to as the “Doogie Howser of electro-magnetics,” was credited as playing a key role in the innovation that made the electric bus possible. An electrical engineer, he helped in moving the charging technology from research to the commercial stage – “before WAVE became WAVE,” as he puts it – and then on through prototype phases of 100-watt, 5-kilowatt, and now 50-kilowatt power transfer. Wu is excited for the technology’s potential. “We would hope that one day it would truly revolutionize the transit industry,” he says. The newest member of the campus shuttle fleet. Like other buses in the U’s campus shuttle fleet, students and faculty with a UCard can ride the electric bus free. The new route through campus won’t open until next year, so the electric bus will be supplementing existing routes in the meantime. Our merry band is now back to the charging station and people are shuffling off. I find myself still in the mindset of magnetic fields, invisible technology, and persistent innovation. Before I step off the bus to catch the next TRAX, with All Hallow’s Eve just around the corner, I look back, half-expecting to see the spirit of Nikola Tesla riding along, grinning for all the world. I don’t see anything, but still it’s there. Shaun Daniel is a graduate student in Environmental Humanities and a graduate assistant in the Sustainability Resource Center.